Broad application comes with side effects–in part due to suboptimal drug-receptor interactions, says study lead Sudha Chakrapani, PhD, associate professor of physiology and biophysics at Case Western Reserve University School of Medicine. "Successful design of safer therapeutics has been slowed because there is a limited understanding of the structure of the serotonin receptor itself, and what happens after serotonin binds to it. Our work is the first to describe how serotonin activates the full-length serotonin receptor at a level of detail to nearly the individual atom." 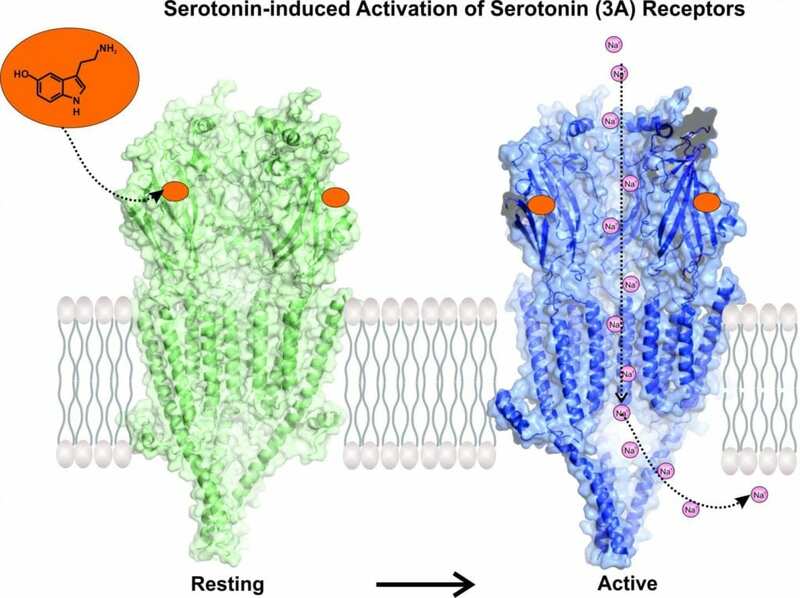 Using Nobel Prize-winning microscope technology, Chakrapani's team studied serotonin as it interacted with its receptor. Their images show serotonin attaching to the receptor and twisting open the channel. Open channels allow molecules to travel from outside the cell to inside. The researchers used simulations to watch as sodium molecules traveled through newly opened channels. The new study highlights distinct conformations of the serotonin receptor that would make a cell more or less permeable to certain molecules–a key insight for drug developers. It also shows which portions of the receptor are most critical for proper channel function. The entire serotonin-receptor occurs in a space about a few billionths of a meter across. Microscopes have only recently evolved to capture such tiny molecules. Cutting-edge technology in the new study–cryo-electron microscopy–earned a 2017 Nobel Prize in chemistry. It uses high-powered microscopes to take snapshots of proteins in action, and compiles them into three-dimensional structural models. In the past year it has already helped Case Western Reserve researchers view structures for proteins central to kidney stones and other ailments. Chakrapani used "cryo-EM" last year to view the serotonin receptor alone, laying the foundation for the present study. This research was, in part, supported by the National Cancer Institute's National Cryo-EM Facility at the Frederick National Laboratory for Cancer Research. The researchers also received assistance from the Cleveland Center for Membrane and Structural Biology and Department of Ophthalmology and Visual Sciences (NIH Core Grant P30EY11373). The study was also supported by a National Institutes of Health grant (1R01GM108921), and Cryo-EM supplement (3R01GM108921-03S1) to S.C and the American Heart Association postdoctoral Fellowship to S.B (17POST33671152). Basak S, et al. "Cryo-reveals two distinct serotonin-bound conformations of full-length 5-HT3A receptor." Nature.